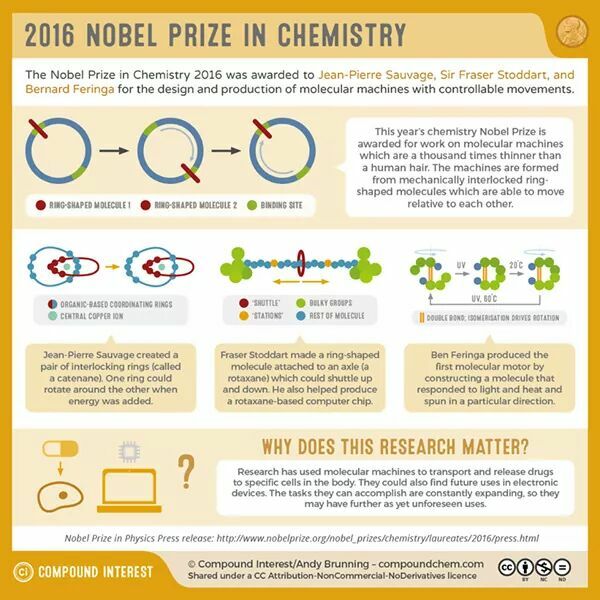 This handy infographic from Compound Interest details the fascinating work on molecular machines by Stoddart, Sauvage and Feringa which has won them this year’s Nobel Prize for chemistry. I was fortunate enough to attend a talk by Sir Fraser Stoddart a couple of years ago, and he is a terrific speaker who has carried out some really good work over the last few decades. Molecular machines are an exciting and interesting research topic, which I have enjoyed learning about throughout my undergraduate and postgraduate studies, and I would definitely recommend taking a closer look at the research which earned them the prize.